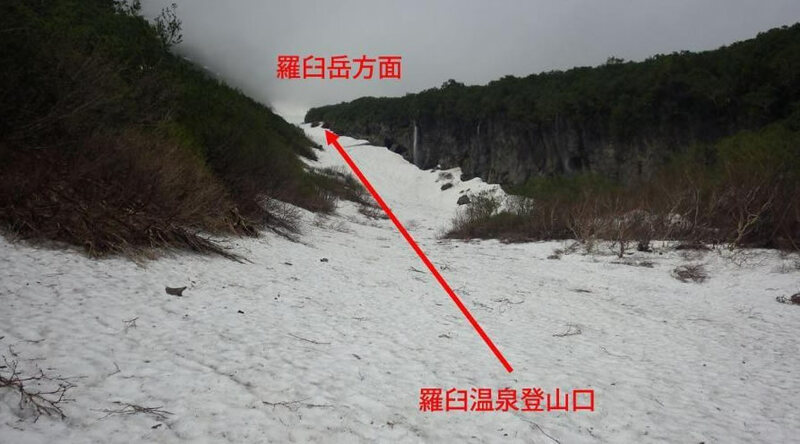 Snow remains from June through August in the Osawa area at 1120–1300 meters (3675–4265 feet) elevation. Maximum walk of about 500 meters (1640 feet) on snow-covered incline. Maximum incline is about 25°. Yasakichimizu (elev. 780 m / 2560 ft): Mountain runoff water, boiling required. Ginreisui (elev. 1040 m / 3412 ft): Mountain runoff water, boiling required. Iwashimizu (elev. 1440 m / 4725 ft): Sometimes dry, boiling required. Rausu-daira (elev. 1340 m / 4396 ft): Designated camping area, space for 5-10 tents, food locker installed. 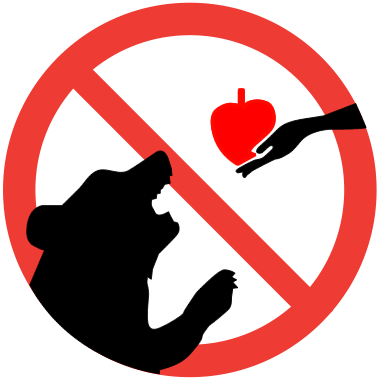 Ginreisui (elev. 1040 m / 3412 ft): Space for 3 tents, portable toilet booth available. Yasakichimizu (elev. 780 m / 2560 ft): Space for 3-5 tents. Depending on the techniques used, walking on snow in snow gorges requires stiff-soled shoes, Alpine poles, crampons, etc. From Utoro to Iwaobetsu Hot Spring (trail entrance): Taxi ¥4000. No scheduled bus service to trail entrance (6 trips/day to Iwaobetsu, 4 km / 2.5 mi before trail entrance). Parking space at the trail entrance is limited to about 10 cars. This is the most popular route for climbing Mt. Rausu and it has many climbers. The trail goes through forest from the entrance to the mountain ridge. It is level for a while at Gokuraku-daira [?] (elev. 840 m / 2755 ft), then becomes a steep incline again. The trail is covered with snow during seasons of remaining snow, so you need to be careful not to lose your way along the trail. Snow at Osawa (elev. 1120–1300 m / 3675–4265 ft) remains until August, and you must trek over a distance of up to 400 [500?] m (1312 [1640?] ft) through on snow through the gorge. The area just below the summit is rocky, so be careful not to fall, and watch out for falling rocks. The entire length of the trail is bear habitat and encounters with bears are possible. Risks: Snow gorge at Byobu Rock. Can lose sight of the trail. Longer than the Iwaobetsu route, trail condition is poor. For experienced climbers. Snow remains on steep inclines near elev. 850 m (2788 ft) above Tomariba. 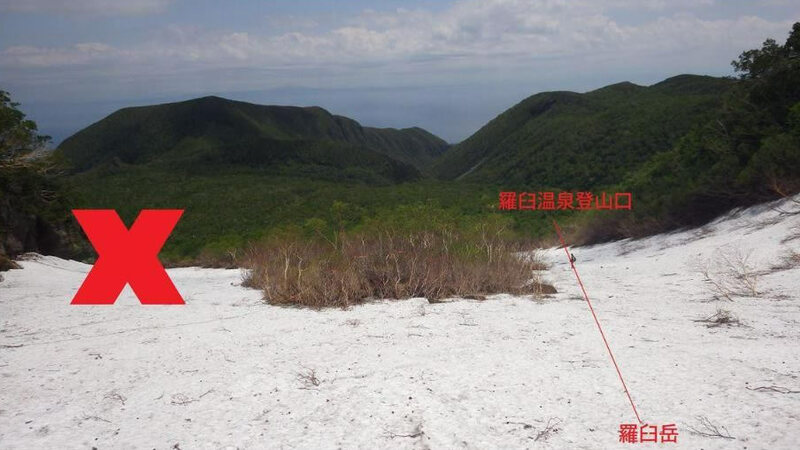 A large amount of snow remains from the Byobu Rock area (elev. 1005–1440 m / 3297–4725 ft) to Raisu-daira and Iwashimizu. During the descent, it is easy to miss the trail that goes to the right, and if you do you will instead go straight ahead to Sashirui Pond. Please be careful. Tomariba (elev. 790 m / 2592 ft): Mountain runoff water (only the runoff water at the far right looking upstream), boiling required. Rausu-daira (elev. 1340 m / 4396 ft): Designated camping area, space for 5-10 tents, food lockers installed. Tomariba (elev. 790 m / 2592 ft): Space for 5 tents. Topographical map of 1:25,000 scale and compass. During season of remaining snow, crampons with at least 10 spikes and ice axes are required. Park at No. 2 parking lot of the Rausu Visitor Center. It is 5 minutes walk from here to the trail entrance behind the Rausu-Onsen (Rausu Hot Spring) camping ground. Since the Rausu-Onsen route is longer, in poor condition, and it is easy to get lost, it is only for experienced climbers. There are also very few climbers. Walk along the mountain stream through the forest to about the midpoint of the route. The traverse along the way at Wall No. 1 and Wall No. 2 is in poor condition, so please watch your footing. From here, follow the painted guide marks along the stream and climb up to Tomariba. 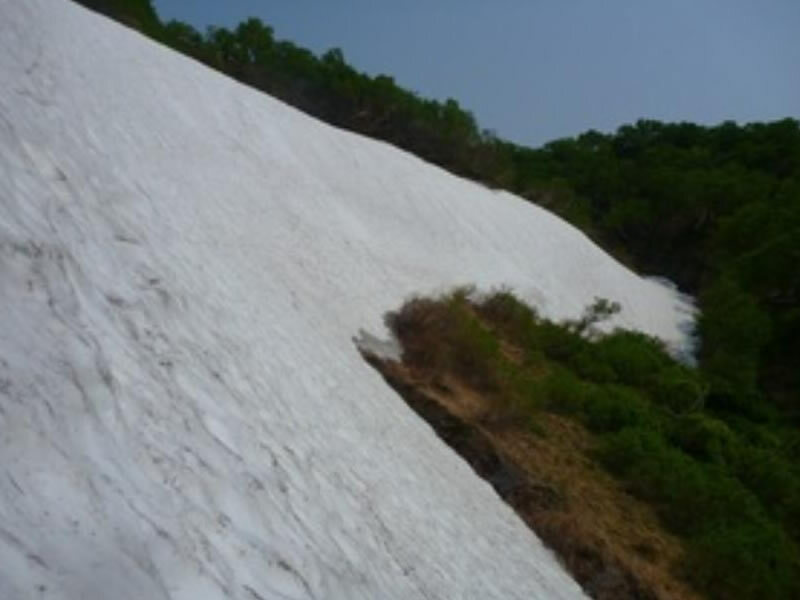 After Tomariba, some snow remains on a steep slope (Photo 1). The distance is short, but crampons are required because of the steep slope. After that, following along the stream, you come to a large snow gorge below Byobu Rock (Photo 2). In normal years, the snow in this gorge completely melts in September. Crampons with at least 10 spikes are required, as some areas are quite steep during the climb. Photo 3: Turning point along the Byobu Rock trail. Here, the trail continues off to the right. When you climb up a large snow gorge from Byobu Rock, you eventually get to a spot where the trail forks with one trail going toward Rausu-daira and the other trail toward Iwaishimizu. When there is remaining snow or mist, it is easy to lose your way along the trail, so be careful. After the snow melts, this area becomes a vast field of flowers. The area just below the summit is rocky, so be careful not to fall, and watch out for falling rocks. The entire length of the trail is bear habitat and encounters with bears are possible. Risks: Can lose sight of the trail, rocky just below summit, snow gorge at Iou mountain stream. Snow remains along the mountain stream from the Iou stream (Iousawa-deai) at elev. 950 m (3117 ft). In June and July, you walk on snow for a distance up to 1000 m (3280 ft). During the descent, it is easy to miss the trail at Iousawa-deai, so you need to be careful. No camp sites along this route. Depending on the techniques used, walking on snow in snow gorges requires stiff-soled shoes, Alpine poles, crampons, ice axes, etc. A section of the road between Kamuiwakka Hot Waterfall and the Mt. Iou trail entrance is closed due to the risk of falling rocks. However, during limited periods, climbers who have applied for special permission are allowed to use the road. The limited period in 2016 is from June 18 to September 25. Climbers who have not applied for permission in advance can do so here. There are few climbers due to the poor access. The trail is not maintained, dwarf pines (haimatsu) block the trail, and there is a risk of getting lost along the trail. Climbers must fill in the special road use permission form set up at Kamuiwakka Hot Waterfall when passing through the section of road that is closed. You walk about 600 meters (0.4 miles) to get to the trail entrance. Then about 650 meters (0.5 miles) further, through the forest, you’ll come to an area of huge rocks lining the new crater, and from here the view opens up. Since the trail along the rocks is not clear, you should carefully follow the guide marks painted on the rocks, and at elev. 750 m (2460 ft) you’ll enter a forest. From Iousawa-deai at elev. 1040 m (3412 ft), you’ll continue along a mountain stream which is also a snow gorge, so in June and July you will be walking a distance of up to 800 m (2625 ft) on snow. The waterfall here dries up as the snowmelt advances, and you will follow a winding road [?] (maki-michi) to cross the dry waterfall. At the upper part of the stream is a gravel area and a road sign. The section from the turnoff for the traverse trail at 1460 m (4790 ft) to the summit is steep and rocky, and there is a danger of rocks falling or your falling. In 2014, a climber died after a fall. ＊ When visibility is poor, accidents frequently occur where climbers head in the direction of Ubushinotta River and need to be rescued. ＊ The entire length of the trail is bear habitat and encounters with bears are possible. The elevation difference, distance, and time given below are all from Rausu-daira to the summit of Mt. Iou. The actual traverse will also include the elevation differences, distances, and times for the climb up to Rausu-daira and for the Mt. Iou climb. Risks: Long trek. Getting lost or slipping and falling while snow remains in the gorges. Getting lost when mist is dense. Slipping and falling at rocky areas. Until July, snow gorges still remain on the slopes of the various peaks and the ridges between them. You must especially be careful not to slip and fall while traversing the steep snowy slope that remains in the section from the summit of Mt. Chienbetsu to the fork in the trail at Crater No. 1 [?]. Also, if there is still some snow in the area around the fork at Crater No. 1, it will be hard to find the trail and climbers sometimes get lost. Mitsumine col (elev. 1360 m / 4462 ft): Snowmelt water, boiling required. No water after snowmelt. Futatsu Pond (elev. 1340 m / 4396 ft): Snowmelt water, sometimes dry, boiling required. If no water here, you can use pond water on the south side, but the quality is poor. You can use a filter, but it is better to bring your own water. Crater No. 1 at Mt. Iou (1390 m / 4560 ft): Snowmelt water, boiling required. This is the most stable water supply along the traverse route, but sometimes it dries up after snowmelt. Mt. Mitsumine (elev. 1360 m / 4462 ft): Space for 5-8 tents, food lockers installed. Futatsu Pond (elev. 1340 m / 4396 ft): Designated camping area, space for 5-8 tents, food lockers installed. In July while snow remains, the camping area is sometimes under water. Mt. Iou Crater No. 1 (elev. 1390 m / 4560 ft): Designated camping area, space for 3-5 tents, food lockers installed. Unlike the Taisetsu Mountains and other areas, the Shiretoko traverse route goes up and down several peaks. Because it is physically demanding, it is for experienced climbers. 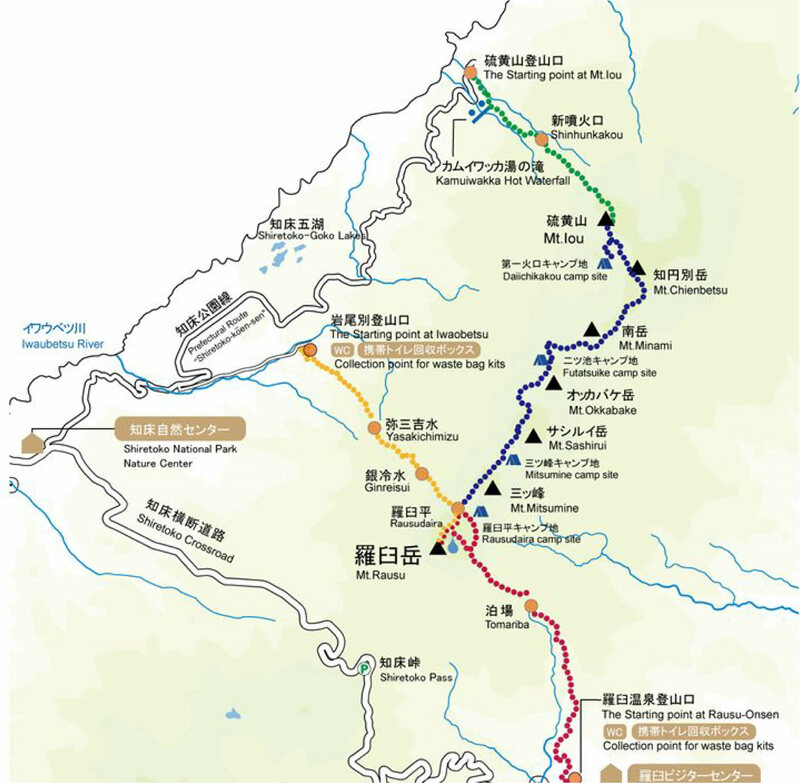 The route goes from Rausu-daira to Mt. Iou via Mt. Mitsumine, Mt. Sashirui, Mt. Okkabake, Mt. Minami, and Mt. Chienbetsu. Since water locations and designated camping sites are limited, the traverse requires careful advance planning. Weather conditions, etc., also need to be considered, as the trail is difficult to walk on at some places and climbers need to pass through rocky areas and walk on snow sometimes. In the past, climbers have had to be rescued because they slipped and fell at rocky areas or lost their way in dense fog.